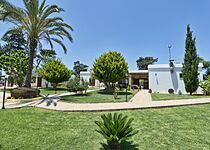 Balci Plaza Hotel Yeni Erenköy: friendly, quiet hotel with pretty beach and countryside setting on the Karpaz Peninsula. Set on the quiet, unspoiled northern coast of the Karpaz Peninsula, the Balci Plaza Hotel is a haven of peace and quiet for those who like their holidays nice and simple. Owner Hasan and his team offer everyone a warm welcome, and the informal atmosphere is a genuine breath of fresh air. There’s even an honesty book at the beach bar - help yourself to cold drinks and pay later at the hotel restaurant! 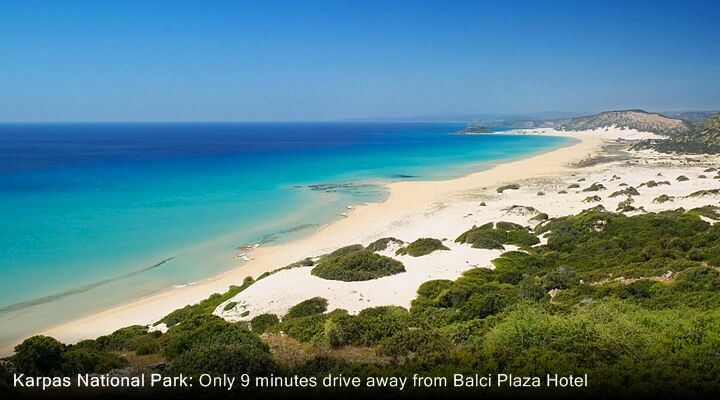 The Balci Plaza beach is just a short stroll down through the fields to a delightful sheltered cove hidden from view. It's how a North Cyprus beach should be: sandy, clean peaceful and with just the right amount of facilities. So you can relax on the sand paddle in the sea, wade out to the rocks, or just lie back on a lounger and chill. There are toilets, and showers to wash off the sand afterwards, and even an honesty bar for cold drinks - just settle up when you get back to the hotel. Made with fresh ingredients grown on the hotel's own vegetable plots, enjoy traditional home-cooked meals on the terrace or in the light and airy dining area with views across the countryside to the hills behind. At breakfast, few can resist the aroma of the home-made bread, freshly baked in a traditional outside bread oven. For dinner try the home-made meze and the wonderful fresh grilled steaks popular with both guests and locals. Then choose a nightcap from the well-stocked bar and watch the sun go down over the sea, a great way to unwind. The spotlessly clean rooms at the Balci Plaza are in six striking tall townhouses set amongst green lawns and with pretty beds of flowers outside. Each apartment/room has views across the countryside and on to the sea, and air conditioning in every room including the lounge and kitchen area. Ground floor rooms have a shaded terrace, upper floor rooms have a balcony that's perfect for watching the glorious Karpaz sunsets - and posting your pictures home using the free WiFi. 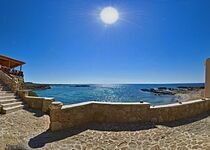 The Karpaz Peninsula is a reminder of the way the Mediterranean used to be; undeveloped, laid back, sometimes rugged but always beautiful. Walk through unspoiled countryside to discover ancient ruins and deserted churches. Drive to deserted beaches miles long and discover nesting sea turtles laying eggs in the warm sands. For a trip few tourists even make, head east to the Karpaz National Park, an area of outstanding natural beauty and home to the Karpaz wild donkeys. At the far end is the Apostolos Andreas Monastery, with its healing spring sacred to St Anthony. It's a rugged ride, so a good hire car is essential, or take one of the organised safari tours - just ask at reception for details. With flights to North Cyprus from several UK regional airports, and a private taxi transfer included with every GNC package holiday, you can arrive relaxed and ready to enjoy your North Cyprus luxury holiday at the Balci Plaza.